Each year, my street comes alive with lilacs. White and mauve, these beautiful blooms scent the air with a sweet smell so perfumed it feels almost fake. But a few short weeks later and the delicate flowers begin to brown, leaving behind a rather plain, dull green tree. And so, on a sunny almost-midsummer's day, we cut the last lilacs in England. Back home, I bottled the essence of lilac to last me until they make their rare appearance again next year. Use this to make fragrant cakes, puddings, or even to add sweetness to a floral iced tea. Layer lilacs with granulated sugar in a large lidded jar. Seal and store in a cool, dark place for a week, shaking every so often. Sieve the blooms out and you're left with lilac sugar. 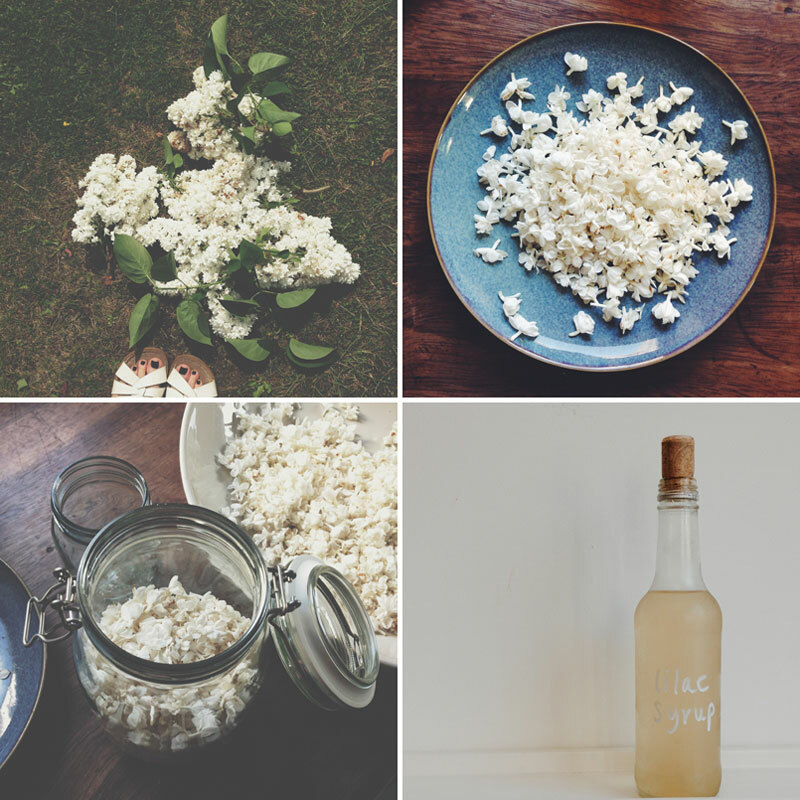 Use this to make a floral kir (just add to sparkling wine), instead of icing for a lilac drizzle cake, or as a topping for yoghurt or ice cream. Measure out your lilacs, and then measure the same volume of water and of sugar. Heat the water and sugar together until the sugar dissolves. Tip in the lilac flowers and simmer on the lowest heat possible for 5 minutes. Take off the heat and leave for another 5 minutes. Sieve out the flowers, and pour your lilac syrup into a sterilised bottle. 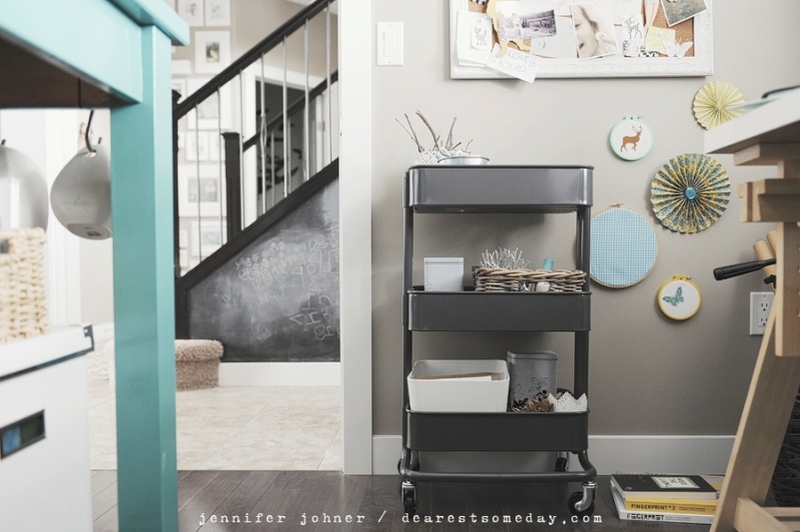 Store in the fridge for a couple of weeks, or in a plastic container in the freezer for longer. Last year, at Lia and Juliet's Supper Club, we ate gooseberry knickerbocker glories. 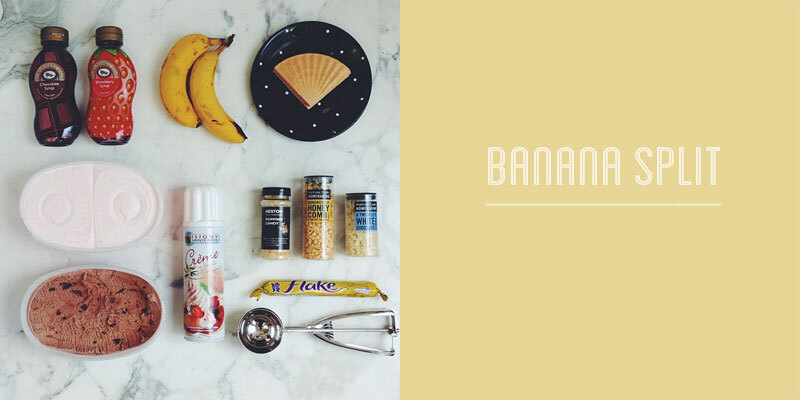 And more recently, I have been unable to stop thinking about banana splits, after Emma described her ingenious banana split kit birthday present. Wow. The kids went crazy for this classic pud (and, secretly, so did we). Got me thinking about other long-lost desserts, such as baked Alaska, Arctic roll, ice cream oysters, and maybe an ice cream float. Funny how food goes out of fashion. What are your favourite retro puddings? What have I forgotten? 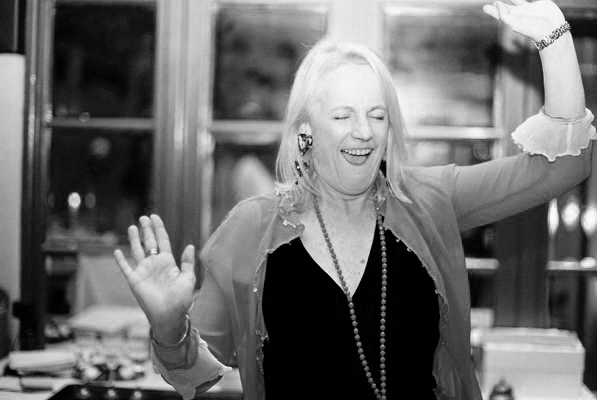 I knew her as my godmother: a brilliant and sweet woman, kind and inventive, and always lots of fun. She was an excellent role model as well; a tough, intelligent woman who carved out a career in what was a very male-dominated world. Her work changed government policy and saved lives (you can read about her life and what she achieved in one of the obituaries written about her in the national press). Sarah inspired so much in me. I stayed with her for a couple of months after I graduated, working as a lowly runner for a live TV programme. She always told me how proud she was and encouraged me to try harder. I remember a time we were at the Clothes Show Live and I spotted a celebrity I admired. Too shy to go and say hello, Sarah said 'if you don't ask, you don't get' and marched over with me. I'll never forget those words; they shaped my outlook and turned me from a weedy, rather spoilt teenager into a braver person. She died over six years ago now, while I was pregnant with A. My mother often says how much she'd love to have met my children, or how proud she'd be of me now. I miss her terribly. A new little series to document the people, places and things - big or small - that change my perceptions, spark something new, or just tickle my fancy. 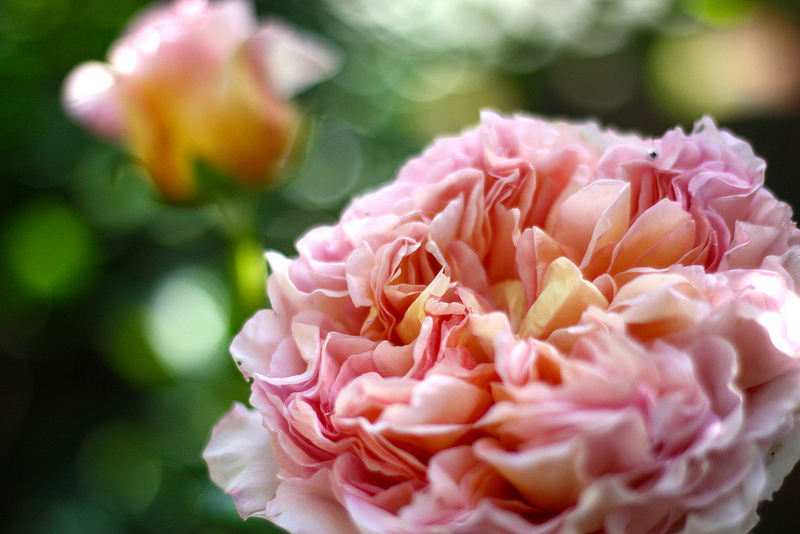 My favourite plant: the rose. I have planted no fewer than ten roses in the 7 years we've lived here; two in the front garden and eight in the back. Now I am really not green-fingered but these beautiful roses seem to be doing ok. I have a thing for big, blowsy blooms, heavily scented and in subtle, dusky shades. 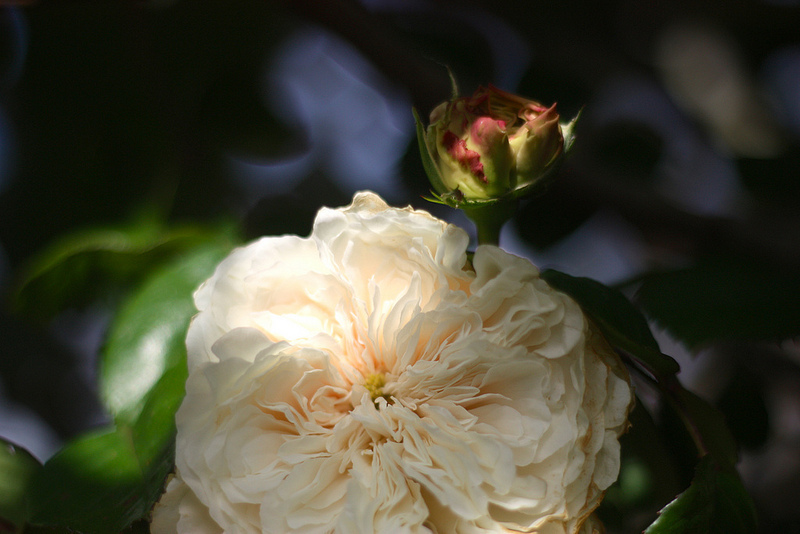 The one I love most of all is called Abraham Darby; it ticks all the boxes. 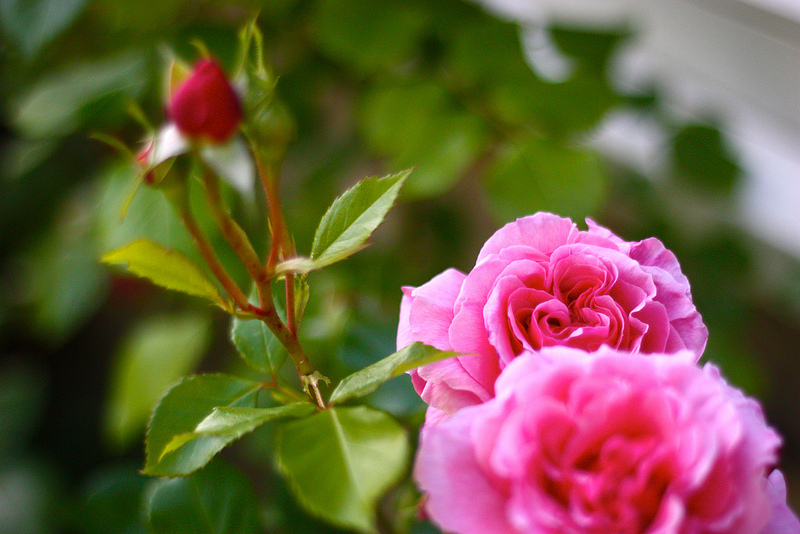 By midsummer, the roses are usually fading away, working up the energy to flower again late summer. Not this year... we are only just seeing the first buds open. 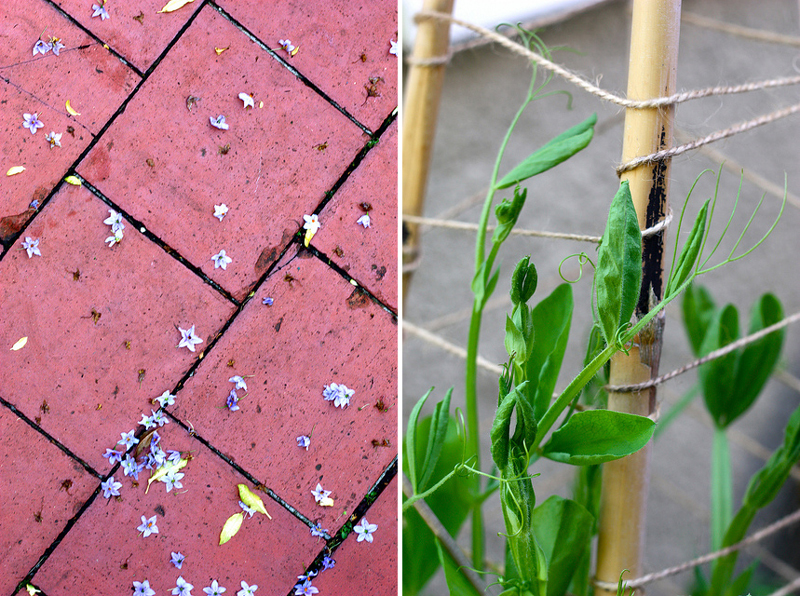 Linking up with two series this week: Lou's Nature in the Home and Annie's How does your garden grow? In honour of such an illustrious occasion I have made a mix tape of my favourite rose-themed songs. It's a little tenuous but the last song is one that can make me cry like a baby. Just so impossibly beautiful. La vie en rose from oysterpots on 8tracks Radio. 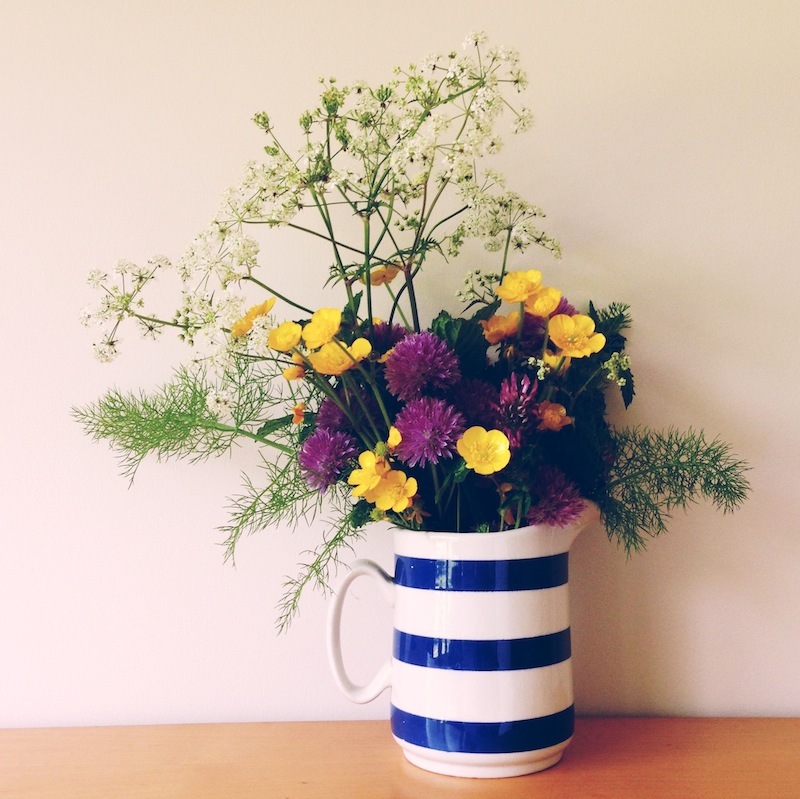 A sweet hedgerow bouquet of fennel, buttercups, clover, chive flowers, cow parsley, and mint; this week's nature in the home entry. The chalet park we stay at in Devon is a classic seventies holiday park. Hundreds of boxy chalets run in rows through the most beautiful countryside, surrounding a big old hotel. Sadly, the hotel is derelict, the kids' playground broken up and the swimming pool filled in. It's such a waste, and yet there is a kind of beauty in the wasteland. On Thursday we went exploring, through the woods, up into the long grass and found ourselves in an overgrown vegetable garden. Bright bunches of chives with pink pompom flowers burst through the cracks in the paving, the fennel had travelled far from its original planting spot, and mint grew in abundance, taking up a vast swathe, metres and metres of the stuff. That afternoon was such a happy one. The kids played so sweetly, the sun shone, and all was right with the world. I'm just putting the finishing touches to a film I made of our holiday, so when it's ready you can see what I mean. We were free.